ACTUAL VIDEO: Matthias Steiner weightlifting DROP On His Neck. 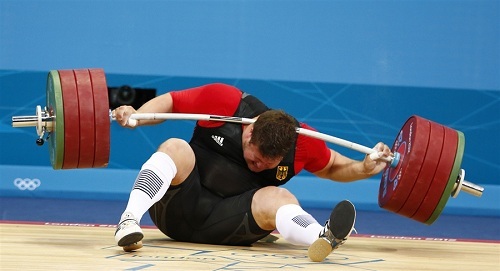 Olympic Weightlifter “Matthias Steiner” DROPS 432 lbs On His Neck!!!! Dropping weights on your neck has to be one of the worst nightmares for an Olympic weightlifter. Even as a spectator, there is a tension when watching these athletes lift astonishing amounts of weight over their heads, especially because of the possibility that something like this will happen. Fortunately, Steiner got up and waved to the crowd after medics rushed over to treat him. Future medical tests will determine the severity of his injury.